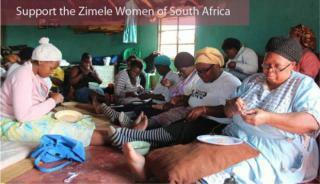 In order to confront the root causes of poverty and remove the barriers to economic self-sufficiency for women in South Africa’s rural communities, Zimele's mission is to empower women with the skills, resources, and support networks to start businesses and social service projects to sustain themselves, their families and their communities. Zimele means “people stand on their own feet” in Zulu. It is a faith-based, non-profit organisation based in Pietermaritzburg, South Africa, that has spearheaded social development and women’s empowerment projects in remote, impoverished areas of KwaZulu-Natal since its inception in early 2007. Zimele is guiding the way to personal empowerment – self-discovery, self-awareness, self-realisation, self-sufficiency, self-fulfillment. Small groups of 10-20 women meet in the familiarity and security of each other’s homes. Zimele staff members assist with defining each woman’s individual strengths and goals, and then guide them towards establishing their own business. Zimele acts as a facilitator between the various independent producers (crafters, farmers etc) and local, regional and international markets. Zimele also identifies current trends that may affect the businesses such as demand for organic and naturally-grown fresh produce and specific craft items. Zimele is a member of Fair Trade International and is also an official member of EZA, a Fair Trade buyer and distributor in Austria and DWP, a Fair Trade buyer and distributor in Germany. Everything that Zimele and its beneficiaries do is in accordance with Fair Trade principles, including the craftwork, guest-houses, our agricultural programme etc. Zimele Craft - Women are traditionally excellent crafters within Zulu society and many rural women have existing craft skills. Through Zimele they are trained to make high quality items, using their incredible talents. They work with fabric, felt and beads to make a range of stationery, bags, decorations, home ware and jewellery. Zimele Agriculture - The agriculture programme aims to support the women to grow sufficient food to not only feed their families but also yield an excess that can be sold at local markets to generate income. The goals are to increase production sustainably and to improve marketing. Different strategies are pursued to achieve these goals. Training is a key strategy and includes agriculture production best practices such as planning; vegetable farming; food processing and preservation; pesticide, disease and weed control; compost and irrigation. Additional training in business skills, marketing and financial management is given. The underlying approach that guides the programme is that of “agro-ecological farming”. Other strategies include building the capacity of a farmers’ association, improving marketing, facilitating the provision of agricultural infrastructure, and the like.